From pre to post installation, we’re committed to consistently providing our customers with the best quality service nationwide. We thank you for bringing your concerns to our attention, and we’ll continue to work with you until your concerns are fully addressed. Thank you for your patience. Because they use local contractors, installation results may vary. But the corporate office is the same and if you should happen to get a terrible contractor like we did -- you're out of luck. The first issue came when we tried to use their price match guaruntee. They wouldn't honor it until after several phone conversations with a very rude Kevin Konfirst, who is some sort of inside sales director. Last year we has laminate floor installed in our home. The installers came and the job was not done well. There was bubbling and the seams did not connect well and it was generally shoddy. They came out to try to repair it, but it needed to be replaced. 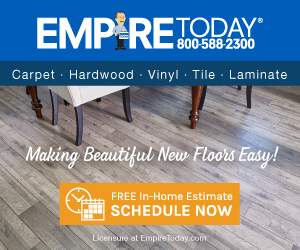 Many calls to Empire Today finally got a new crew to come out and reinstall the entire floor. This was a massive headache in and of itself. After the new floor was installed, we noticed immediately that the seams were bubbling up and that the floor looked terrible. After waiting for over a month for a manager to come and inspect the flooring he did. We didn't hear from him for another month. Call after call finally ended with us being told today that they decided that the floor wasn't defective. This is insane. But they did offer to replace the entire floor again (but not give us a refund). So, there's nothing wrong with it, but we'll come fix it anyway? We just want a refund at this point. Worst experience of this type we've ever had. They sent out an "independent" inspector who was so incompetent we couldn't even get him to come on a day we were home. Scheduling was a nightmare and we never heard from any of them again. Then I complain again and they act like they tried to contact us but we never heard from them. The said that our new floor of LESS THAN A FEW WEEKS OLD was water damaged. But they'll send the "independent" inspector out again. Insane. Review #1226256 is a subjective opinion of VisibleBarracuda.